One of my few gripes with the Xiaomi Mi 5 that I’m currently using is that it used to be slow to load Google Now when I long-pressed the home button. That’s since been fixed with the latest software update, but I did dig around for a better way to quickly search the Web. Luckily, I stumbled upon Custom Search Bar Widget (CSBW). The imaginatively-named app is exactly what you’d expect: A widget with plenty of options to tweak its appearance and behavior. Tap it and it pops up an overlay screen that you can search from, just the way you like. The app itself is free; an in-app purchase unlocks themes that you can apply to the widget. In addition to being able to adjust the way it looks so it blends in nicely with your home screen setup, CSBW is also one heck of a useful search tool. You can add a range of search engines to the widget and use them to look things up directly, instead of relying only on Google. I love being able to search YouTube instead of going through Google’s video results; I also have Google Play set up so I can find apps I hear about or need to reinstall quickly. You can also add other search options for DuckDuckGo, Amazon, Dropbox, Gmail, Google Drive, Spotify, Twitter and Wikipedia. CSBW also lets you add shortcuts to your favorite apps on the search overlay screen and even a button to paste whatever’s in your clipboard into the search box. 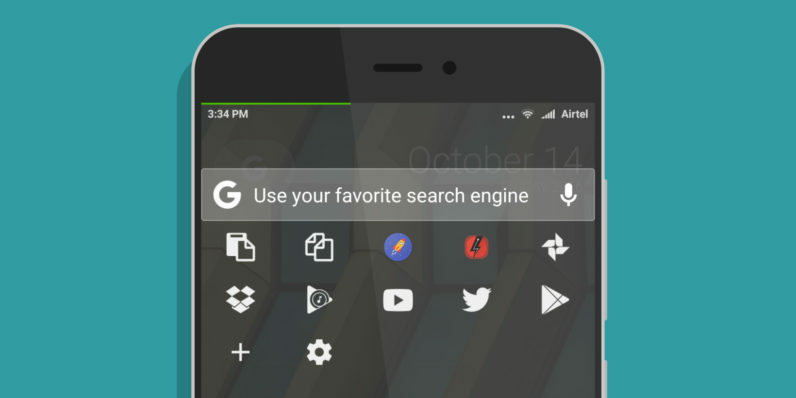 The latest update to the app has added Google’s Pixel Launcher widget styling, which includes the ‘G’ button along with a minimalist clock and date display. If you frequently use search on your phone, or you simply enjoy customizing your Android device interface, this will make an excellent addition to your home screen. Grab CSBW from Google Play to give it a go.